Deep learning algorithms are good at mapping input to output given labeled datasets thanks to its exceptional capability to express non-linear representations. This kind of tasks is known as classification, while someone has to label those data. Whether labeling images of XRay or topics for news reports, it depends on human intervention and can become quite costly as datasets grow larger. 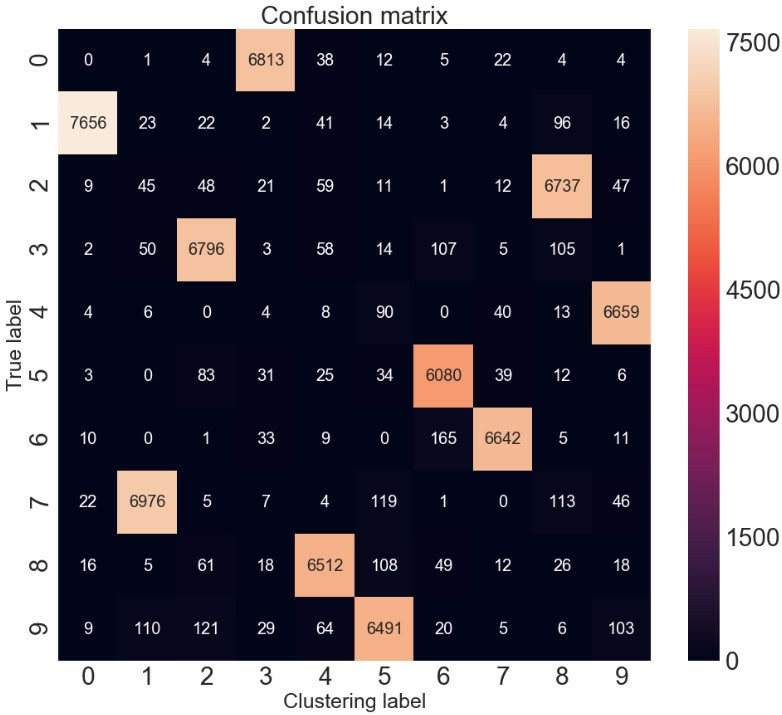 Cluster analysis or clustering is one of the unsupervised machine learning technique doesn’t require labeled data. It does this by grouping datasets by their similarities. Why should you care about clustering or cluster analysis? Let me show you some ideas. Recommendation system, by learning the users’ purchase history, a clustering model can segment users by similarities, helping you find like-minded users or related products. In biology, sequence clustering algorithms attempt to group biological sequences that are somehow related. 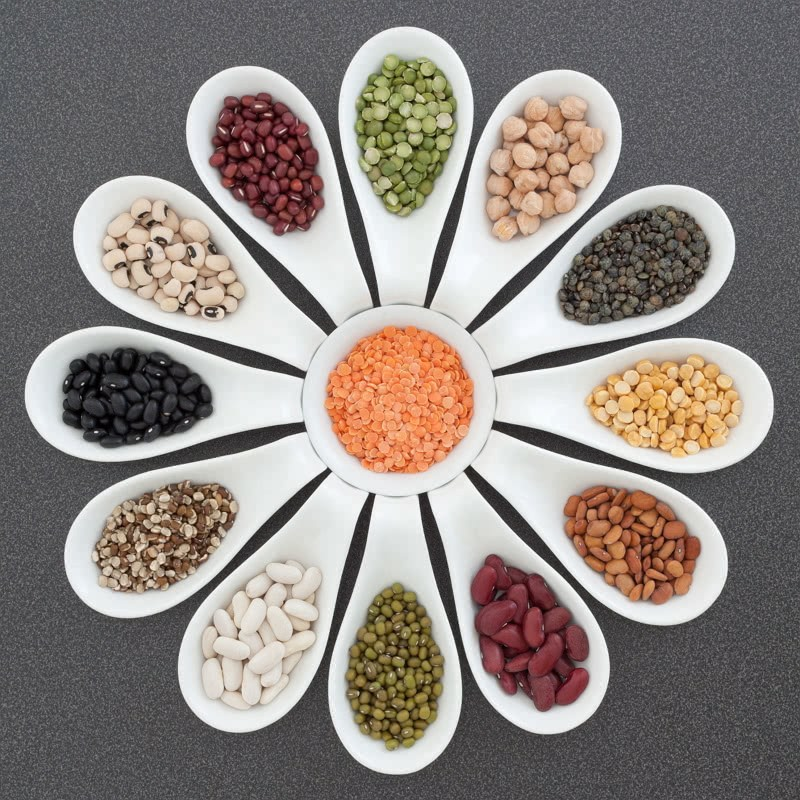 Proteins were clustered according to their amino acid content. Image or video clustering analysis to divide them groups based on similarities. In a medical database, each patient may have a distinct real-valued measure for specific tests (e.g., glucose, cholesterol). Clustering patients first may help us understand how binning should be done on real-valued features to reduce feature sparsity and improve accuracy on classification tasks such as survival prediction of cancer patients. General use case, generating a compact summary of data for classification, pattern discovery, hypothesis generation and testing. Anyway, clustering is a valuable asset to acquire for any data scientists. The traditional K-means algorithm is fast and applicable to a wide range of problems. However, their distance metrics are limited to the original data space, and it tends to be ineffective when input dimensionality is high, for example, images. Let’s train a K-Means model to cluster the MNIST handwritten digits to 10 clusters. The evaluated K-Means clustering accuracy is 53.2%, we will compare it with our deep embedding clustering model later. An autoencoder, pre-trained to learn the initial condensed representation of the unlabeled datasets. A clustering layer stacked on the encoder to assign encoder output to a cluster. The clustering layer’s weights are initialized with K-Means’ cluster centers based on the current assessment. Train the clustering model to refine the clustering layer and encoder jointly. Looking for the source code? Get it on my GitHub. 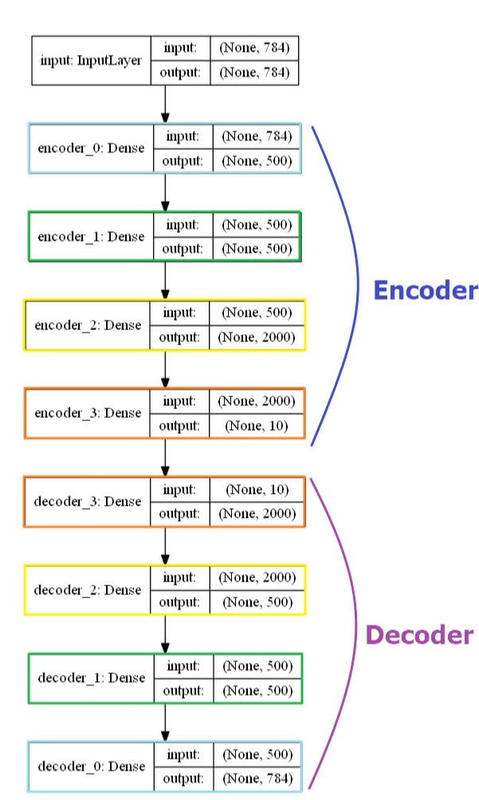 Autoencoder is a data compression algorithm where there are two major parts, encoder, and decoder. The encoder’s job is to compress the input data to lower dimensional features. For example, one sample of the 28x28 MNIST image has 784 pixels in total, the encoder we built can compress it to an array with only ten floating point numbers also known as the features of an image. The decoder part, on the other hand, takes the compressed features as input and reconstruct an image as close to the original image as possible. Autoencoder is unsupervised learning algorithm in nature since during training it takes only the images themselves and not need labels. 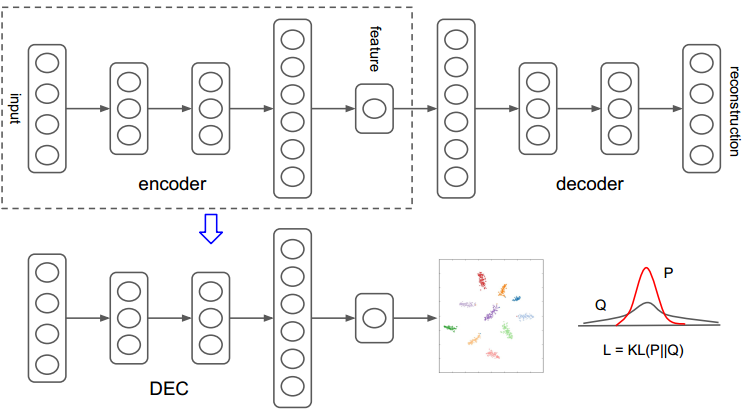 The autoencoder we build is one fully connected symmetric model, symmetric on how an image is compressed and decompressed by exact opposite manners. We are going to train the autoencoder for 300 epochs and save the model weights for later. By training the autoencoder, we have its encoder part learned to compress each image into ten floating point values. You may be thinking, since the input dimensionality is reduced to 10, K-Means should be able to do the clustering from here? Yes, we are going to use K-Means to generate the cluster centroids, which is the 10 clusters’ centers in the 10-D feature space. But we are also going to build our custom clustering layer to convert input features to cluster label probability. The probability is calculated by student’s t-distribution. T-distribution, as same as used in the t-SNE algorithm, measure the similarity between an embedded point and a centroid. And as you might guess the clustering layer acts similar to K-means for clustering, and the layer’s weights represent the cluster centroids which can be initialized by training a K-means. If you are new to build custom layer in Keras, there are three mandatory methods you will implement. build(input_shape), where you define the layer's weights, in our case the 10 clusters in 10-D feature space, that is 10x10 weight variables. call(x), where the layer logic lives, that is where the mapping from the features to clustering labels' magic happens. compute_output_shape(input_shape), specify here the shape transformation logic from input to output shapes. Next, we stack a clustering layer after the pre-trained encoder to form the clustering model. For the clustering layer, we are initializing its weights, the cluster centers using k-means trained on feature vectors of all images. The next step is to improve the clustering assignment and feature representation simultaneously. For this purpose, we will define a centroid-based target probability distribution and minimize its KL divergence against the model clustering result. We would like to have the target distribution to have the following properties. Strengthen predictions, i.e., improve cluster purity. Put more emphasis on data points assigned with high confidence. Prevent large clusters from distorting the hidden feature space. The target distribution is computed by first raising q (the encoded feature vectors) to the second power and then normalizing by frequency per cluster. It is necessary to iteratively refine the clusters by learning from the high confidence assignments with the help of the auxiliary target distribution. After a specific number of iteration, the target distribution is updated, and the clustering model will be trained to minimize the KL divergence loss between the target distribution and the clustering output. The training strategy can be seen as a form of self-training. As in self-training, we take an initial classifier and an unlabeled dataset, then label the dataset with the classifier to train on its high confidence predictions. The loss function, KL divergence or Kullback–Leibler divergence it is a measure of behavior difference between two different distributions. We want to minimize it so that the target distribution is as close to the clustering output distribution as possible. In the following code snippet, the target distribution updates every 140 training iteration. You will see the clustering accuracy steadily increasing after each update. The metric says it has reached 96.2% clustering accuracy, which is quite good considering that the inputs are unlabeled images. Let’s take a closer look at how the accuracy it is derived. This metric takes a cluster assignment from an unsupervised algorithm and a ground truth assignment and then finds the best matching between them. The best mapping can be efficiently computed by the Hungarian algorithm which is implemented in scikit learn library as linear_assignment. It is more straightforward to look at the confusion matrix. Here you can quickly match the clustering assignment by hand, e.g., cluster 1 matches with true label 7 or handwritten digit “7” and vise visa. The confusion matrix plotting code snippet shown below. Since we are dealing with image datasets, its worth a try with a convolutional autoencoder instead of one build only with fully connected layers. One thing worth mentioning, to reconstruct the image, you can either pick deconvolutional layers(Conv2DTranspose in Keras) or upsampling(UpSampling2D) layers for fewer artifacts problems. The experimental result for convolutional autoencoders is available on my GitHub. We have learned how to build a keras model to perform clustering analysis with unlabeled datasets. Pre-trained autoencoder played a significant role in the dimensional reduction and parameter initialization, then custom built clustering layer was trained against a target distribution to refine the accuracy further. Unsupervised Deep Embedding for Clustering Analysis — inspired me to write this post. The full source code is on my GitHub, read until the end of the notebook since you will discover another alternative way to minimize clustering and autoencoder loss at the same time which proven to be useful to improve the clustering accuracy of the convolutional clustering model.